The Blues Brothers are up on stage in that dingy old honky tonk, and the rowdy crowd is hurtling beer bottles. Apparently, cowboys aren't big fans of the blues, so the Brothers huddle up and decide what to do to appease their crowd; they will play the only song they know with a cowboy theme: "Rawhide." Whips crack. The crowd goes wild. Even in this venue, the Blues Brothers turn out to be a big hit. I must have seen this film a thousand times, but here - the one thousand and first viewing - I paused to wonder where this song "Rawhide" came from. Oh, I know about the 1959 Clint Eastwood television show by the same name that used the song as a theme song - I guess the question I really want answered is "who sang it?" Well, I found out that this story takes us all the way back to 1913 with the birth of little Francesco Paolo LoVecchio. Born in Chicago of Sicilian parents, Little Francesco began a career in singing as a Catholic choirboy and grew up to dance and entertain on the marathon circuit. After bouncing around nightclubs in the ensuing years - from Chicago to Connecticut - Frankie tried New York and failed and tried again. 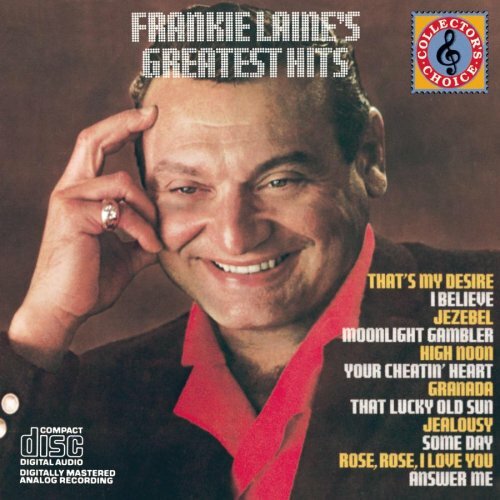 This time a radio station, WINS, hired him to sing, and Jack Coombs convinced his new singer to Americanize his name; thus was made the great Frankie Laine. But the "great" was still slow in coming. Frankie soon lost his job and bounced around singing and hoping for many more years. Then one day - his luck changed. Frankie was chosen to sing "I May Be Wrong But I Think You're Wonderful" on the B side of a Mercury record. Carrying it himself to DJ Al Jarvis, Frankie got it on the air, and, as he says in his autobiography, "That Lucky Old Sun," "The floodgates finally broke open." Frankie had promised himself he would not go back to New York unless he was on a white horse - and go back on a white horse he did. The last time he had been there, he had struggled and even found himself sleeping on a roughened wooden bench in Central Park eating penny Baby Ruth candy bars to stay alive. This time, with many number one songs to his name, Frankie returned to sit on that same bench in an expensive suit with an expensive suite key in his pocket - and an engagement at the Paramount on his mind. Within a few years, he would be mobbed with fans and even entertain the Queen of England in a command performance. Then, in 1958, the singer of a stream of such number one hits as "That's My Desire" and "On the Sunny Side of the Street" was asked to sing the theme song for a new television show starring a new actor, and, of course, this was the moment that gave birth to the international hit "Rawhide." Thus we see that those cowboys in that dingy old honky tonk may just have been bigger fans of the blues than they knew - after all, they were applauding a song made famous by a bluesy, jazzy singer who struggled for many a year before finally making a name as the great Frankie Laine.